Eighty-two 4000-meter peaks rise in the Alps above Switzerland, Italy and France, tempting the alpine adventurer with a lofty array of snow-capped summits. Few alpinists climb them all, and fewer still climb them all in one push. On August 11, Ueli "The Swiss Machine" Steck completed the feat in 62 days. Steck's grueling display of speed and endurance on these peaks adds to his long list of mountaineering accomplishments, including speed records on 8000-meter peaks Annapurna (8091m) and Shishapangma (8027m). Steck—who began the 82-peak challenge on June 11 with an ascent of Switzerland's Piz Bernina (4049m)— reportedly did not set out to break the current record of 60 days, but instead to finish them all in one push, without the use of motorized travel. Steck, often accompanied with others, traveled between basecamps on foot and by bike, and descended some peaks by paraglider. The highest summit he reached was Mont Blanc (4810m). The finishing peaks were Pic Lory (4088m) and Barre des Ecrins (4102m) on Les Ecrins Massif on August 11. Steck did not set a new record. 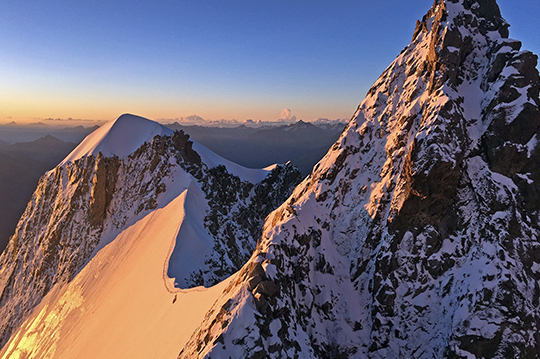 On July 22 one of Steck's partners, Martijn Seuren, died after falling from a ridge on the Mont Blanc massif. Steck wrote on his website: "I am deeply saddened by the tragic death of my colleague Martijn Seuren.... I want to express my deepest condolences to Martijn's family and friends. Out of consideration for the family I won't add further comment on this tragic event and I ask you all to respect this as well. " 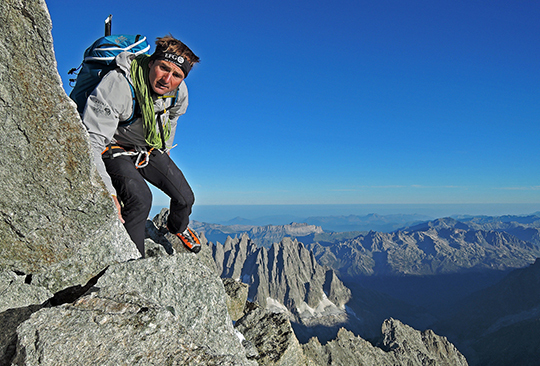 Steck shared his thoughts over email with Alpinist. 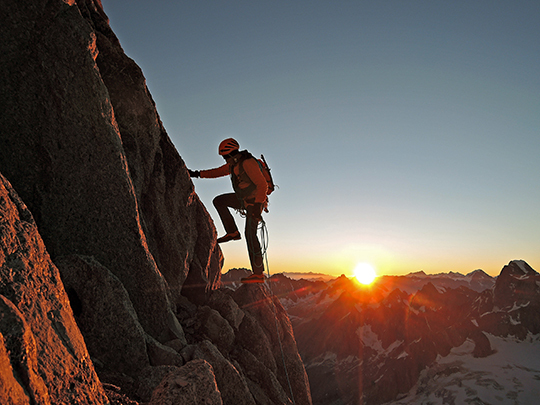 Alpinist: Tell us more about your quest—what inspired you? Ueli Steck: This idea is already quite old. [The first attempt was made by] Patrick Berhault and Philippe Magnin in 2004. On Summit 67, Taschhorn (4491m), Berhault fell through a cornice and died. The first [person to complete the challenge of] climbing all the 4000-meter peaks in the Alps in one push was the Slovenian [mountaineer] Miha Valic. He climbed [them] in 102 days in 2007. In 2008 Italian [climbers] Franco Nicolini and Diego Giovannini finished it in 60 days. I was very inspired from this idea, so I decided to try it also. [Editor's note: Valic drove between the peaks in a van, while Nicolini and Giovannini completed the task by linking the peaks by foot, bike, and ski]. Alpinist: How did it compare to climbing Annapurna and Shishapangma fast? US: [Instead of] waiting in a basecamp and hoping for good weather and good conditions, [this] was just moving all the time. It was a great journey. I really enjoyed it from the beginning [and] am pretty [happy] that it worked out. You need a lot of luck with weather and conditions to do this. Alpinist: I understand you originally planned to link all 82 4000-meter peaks with German alpinist Michi Wohlleben. Why didn't that work out? US: [On] June 11 I was...with Michi Wohlleben on top of Piz Bernina (4048m), the first summit. Unfortunately, Michi got hurt crashing his paraglider on the way down from the Schreckhorn Hut [and] he had to give up. So the whole project went in a completely different [direction]. In the following weeks I climbed a lot with different people, or solo. I climbed altogether 30 peaks solo and 52 with partners. I climbed some peaks with my wife, Nicole, which was totally cool to have her [with me as] part of my project. Then there were days when I climbed with very strong partners like Andreas Steindl, a young mountain guide and ski alpinist. In one day [we climbed] 18 peaks in around 14 hours. The next morning we ran down from Klein Matterhorn (3883m), and we finished the whole Monte Rosa Massif traverse, and [climbed] the Matterhorn (4478m) that day. Then again, I had a lot of friends coming along. It was just great [and they provided a lot] of inspiration. Alpinist: What are your takeaways? US: There will [always be] a lot of memories in my mind. That's what counts. This is what we get from these adventures...as soon as we live them, they are gone. The memories of the climbs are transitory. Unfortunately it's already over as soon you are back in the valley. It's already been lived. So there is nothing about it anymore except the memories in your head. I want to live more adventures. That's the only way to refresh the feelings. Climbing is about living it. I am looking forward to my next climb, my next run.